Basics-Follow your passions! 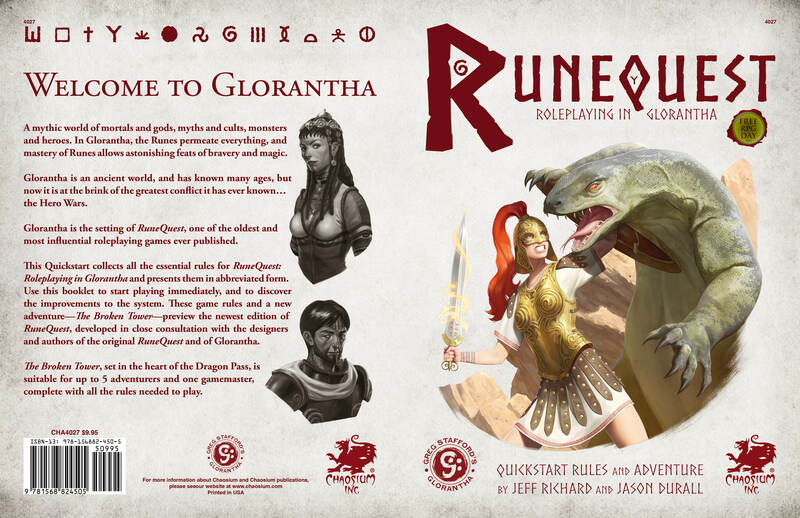 In this revamp of a classic fantasy RPG from Chaosium, players take the rolls of heroes of Glorantha, a land of gods, monsters, and heros. This world feels a bit like a more DnD’ed version of Rome. Let’s break down the game into its pieces. Base System- If you can play Chaosium’s Call of Cthulhu system, you are ready for this. Players have a number of skills or attributes. When you attempt to do anything, you get to roll a 100 sided die. If you roll under your skill or attribute, you succeed. if you get under half, you get a special success. If you get under one-fifth your skill, you get a critical. It’s slick. If you are up against somebody, then you just compare the degree of success using this progression-critical Success bets special success beat regular success beats failure with ties going to the defender. Passions-A major change from 7th edition Call of Cthulhu is the loss of the advantage die, but this system adds passions. Each character has a number of things they care about. When you want to see if you can dig deep and fuel an action through your love of a thing, you try to roll under the level of your passion. If you succeed, you add to the skill you are trying to perform. The higher degree of success the more you add. Failure and critical failure cause you to LOSE from your skill. It’s another slick add-on to the Call of Cthulhu system. Combat- Here is a major departure from the Call of Cthulhu system. Each action you do takes time. Each round you select what actions you want to do, then everyone tells the GM. The GM then ranks the combatants according to their action times with slower times going last. These actions include moving, attacking, casting a spell, reloading, and many other possible things you can do in under 12 seconds. Actions can take longer, but they happen multiple turns later if they need to. Magic-Spirit vs. Runes-Magic in this system is an interesting mix. First and foremost, its TWO systems instead of one. Spirit magic is the base magic everyone uses with a character casting spells by spending points to make the spell go off. This is the slow magic. The second way you cast magic is through runes. As you almost level up in different factions and religions, you unlock new runic magic and points. Runic magic goes earlier in combat and is slightly more powerful, but you get less rune magic points. So knowing when to use each spell is an important part of combat. Some skills require resistance tests like saving throws, while some do not. Beyond that the system effortlessly uses percentile dice for all its execution. >It explains the system pretty well. I have a few tiny questions like in what order to characters declare the actions? The streamlined version of RuneQuest 2nd Edition (Basic Role-Playing 2nd Edition) recognizes that some GMs can’t help themselves and has it shift each round. The GM declares first in one round, and in the next, the PCs declare first. Also from 2e is that players can abort their actions (say, the troll ducked around the corner, maybe I won’t fire my arrow at a wall) but not redirect them to a new target. Oh I agree with you, but how do I handle multiple pcs on the same tick? Its nothing major, and a smaller product. In the full I think it’s probably fully explained.